NEWS: Bionic Nerf Gun Arm! Cybernetics is no longer a thing that appears merely in sci-fi films - now everyday people are becoming cyborgs. 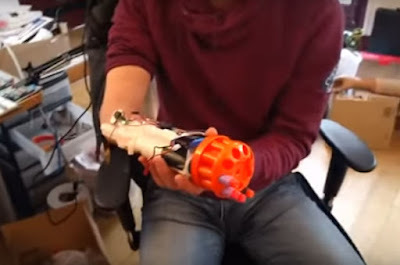 The guys at Hackerloop decided to give their friend Nicholas, who last his hand in an accident, a late Christmas present, by creating a prosthetic arm that controls an actual firing Nerf blaster. Pretty incredible, and although the technology has been used for something fun in this instance, the fact that a group of friends can get togther a build something like this at home is great news for people missing limbs. Who knows, one day we might all have a Nerf gun attached to our bodies. We want that now!